This week on My Favorite Pens we take a look at an uncommon Paul Wirt Overlay! This pen came to me via a good friend who knows my affection for Paul Wirt pens. I have quite a number of them and I have two friends who are always on the lookout for me. This one was offered to me along with an early Waterman with a more uncommon overlay, but between the two I chose the Wirt, a far more uncommon and hard to find pen. I believe I chose wisely. 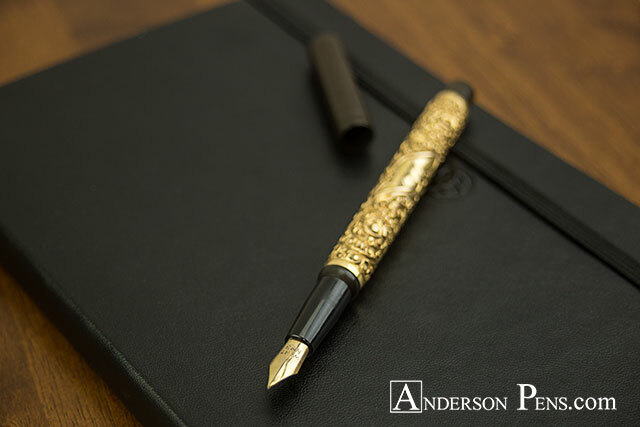 The pen is an eyedropper and has a beautiful gold filled overlay on the barrel. An interesting note is the pen has the Paul Wirt imprint on the cap. While this may not be uncommon for Wirt, it is not as widely seen as no imprint at all on the pen, the main identifying feature being the nib and feed as well as the overall design. 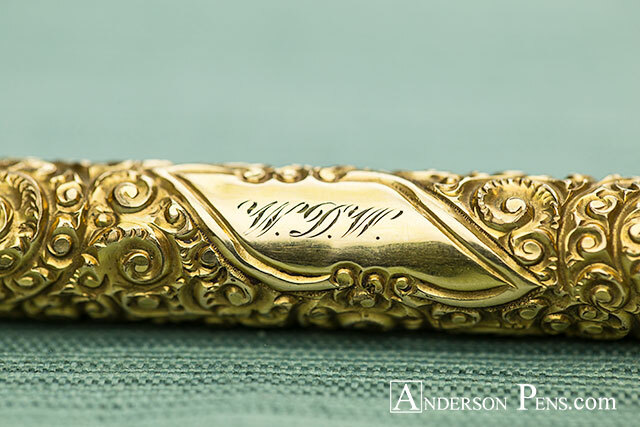 This pen has the original owner’s initials present on the barrel, W.D.W beautifully engraved. One can only wonder if this was a gift, or perhaps a well to do businessman owned this pen to show off his status and position in life. One thing is for certain, it would not have been inexpensive during its day. The most identifiable feature found on Wirt Pens is the nib and feed setup which was patented in 1902. The nib has no breather hole and the feed is vented. Wirt discovered that a nib could be vented out the feed and still leave the nib beautiful and untouched with its ventless simplicity. This does often have the negative side effect of a nib slit cracking and extending, and should be considered by anyone using these pens and flexing the nibs. 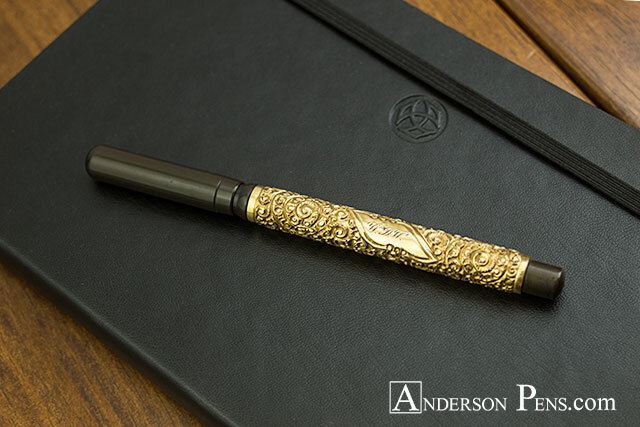 This pen has a variant on the snail or chased pattern, that being both large and small snail patterns intermingled on the barrel. 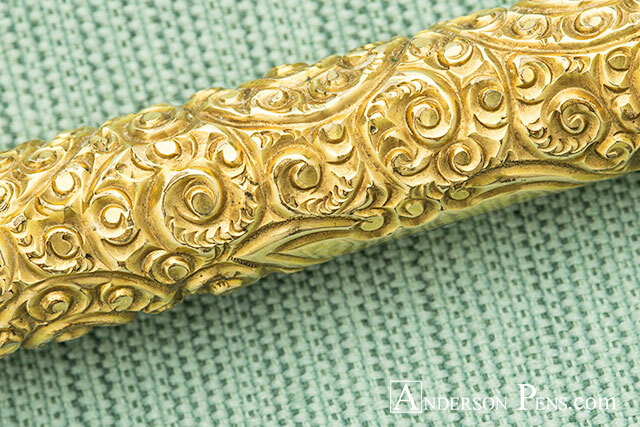 The gold fill overlay on this pen is particularly well preserved with minimal brassing. The proportion of the barrel to cap on this pen is largely skewed towards the long barrel. The cap being quite short. Many overlay of the period have a shorter length overlay. The beautiful overlay work and simplistic nib and feed setup on this Paul Wirt, make it one of my favorite pens. 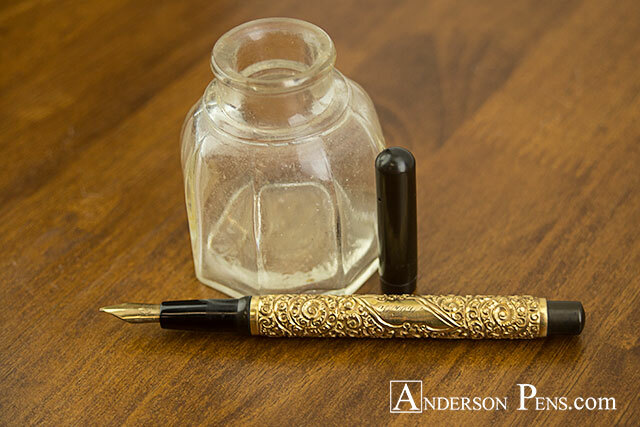 This entry was posted in My Favorite Pens, Vintage Fountain Pens and tagged Vintage. Bookmark the permalink.